It seems that I am forever tweaking things in the sewing room. I am always looking for things that could work or work better. I found this little cart at a local antique fest. You know that enamel top got me! It had lost its wheels, the poor thing. A trip to Menard’s remedied that! While I was there, I picked up some spray paint. It really needed a bit of a do-over and if I were going to paint, it might as well be red! Not perfect, but better! At the same place, I found one of these paper roll holders. I have wanted one forever, but I am too cheap to pay the prices I have seen on these. This one was a bargain at $15 so it came home with me. Hubby has a piece of wood that I will mount it to rather than permanently fixing it to my table top. I had a roll of paper from Ikea, but it was too long! Ugh! Well, necessity is the mother of invention, so I wrapped painters tape around the roll in one spot and used a hack saw to cut it down to size. Then I had a small roll that I can use for paper piecing the borders for my Gwennie Inspired QAL Medallion. It was a win-win! The cabinets in my sewing room are nearing 20 years old now. Hard to believe! Until you looked at those brass trimmed knobs. I found a whole bag of new knobs for $4.99 so I switched them out. Don’t they look better? Changing all 20 of them took about 20 minutes. This entry was posted in Sewing Room Pics, Uncategorized. Bookmark the permalink. I love your cart, especially after the painting! You are so innovative!! So, why do you need a roll of paper? Just curious! Table looks great. You are an inspiration on how to use found things to make things new. That little table looks so spiffy now! I laughed at your story about the paper roll and the hacksaw. Sounds like something I would have done. Great find on the knobs. Such a little thing can make such a difference! I love thrift store and antique mall shopping. Reading about your successes was a treat. You find such great things!! I have wanted a paper dispenser like that for a long while too – it made me laugh that you had to cut your roll of paper down – but what a result! 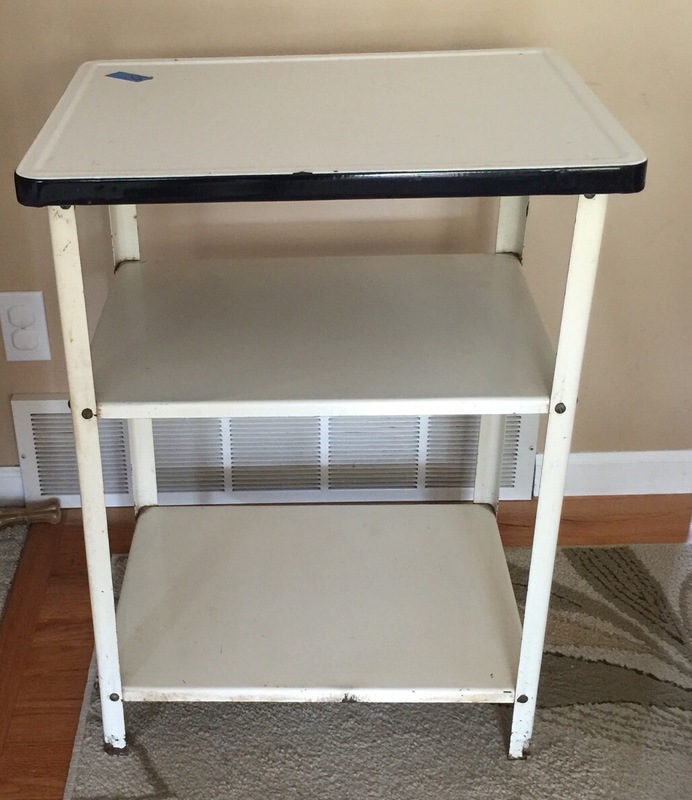 I absolutely LOVE reading about your finds and re-purposing of items. I imagine your sewing room will be filled soon! Great makeover on the table. The red looks fabulous. 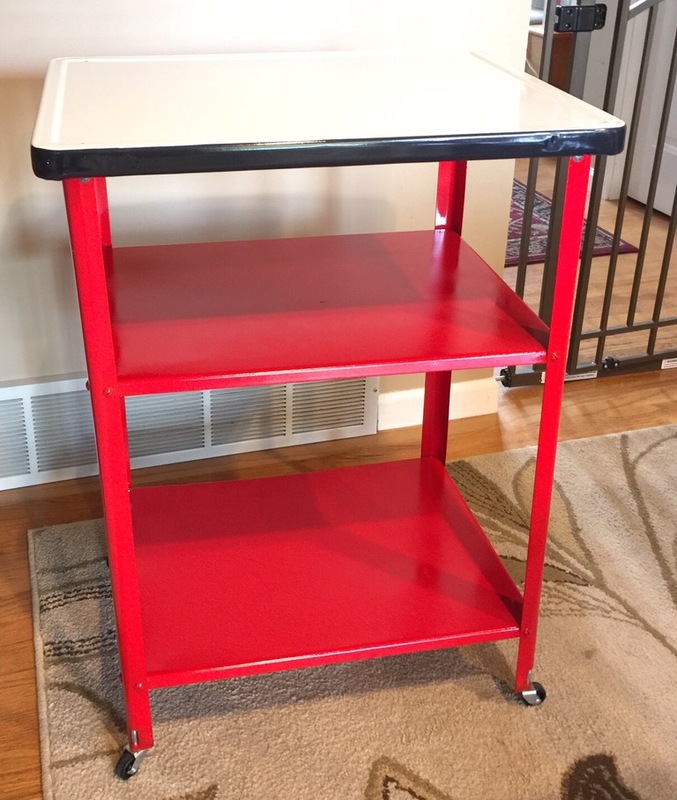 What a great post….love that little cart, and really love the red paint! 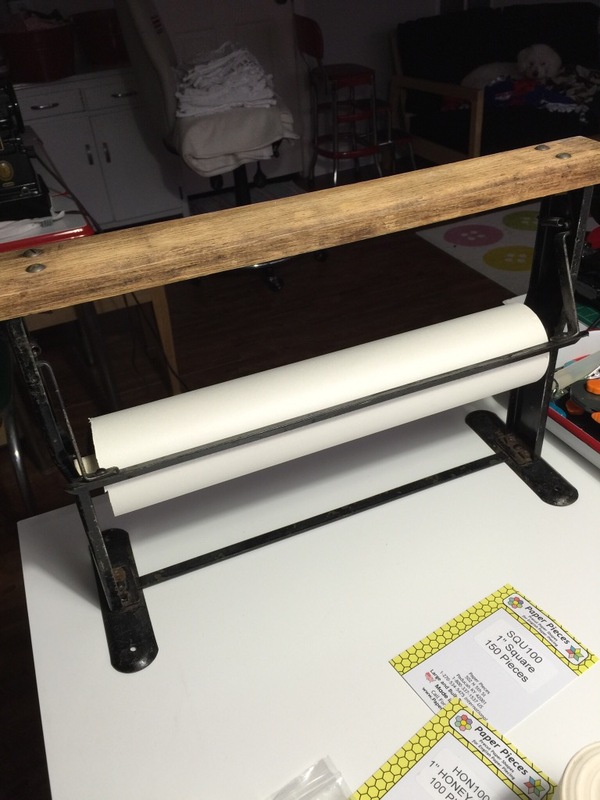 The paper roll holder is great, and I love that you didn’t hesitate to cut down the paper roll to fit! And your new knobs look so good…and a great price, too….love how something so small is all that you need to update an old piece…. Fabulous makeovers! It’s amazing how something so simple as changing knobs can make such a huge difference … and usually not for too much money. wow very nice rehab on the cart! Oh I love a good makeover! I love the red paint, just right! Have fun on the next Gwennie go round! Love the make-over on the cart. What wonderful finds! I love re-purposing items. You have a marvelous eye for re-homing items! 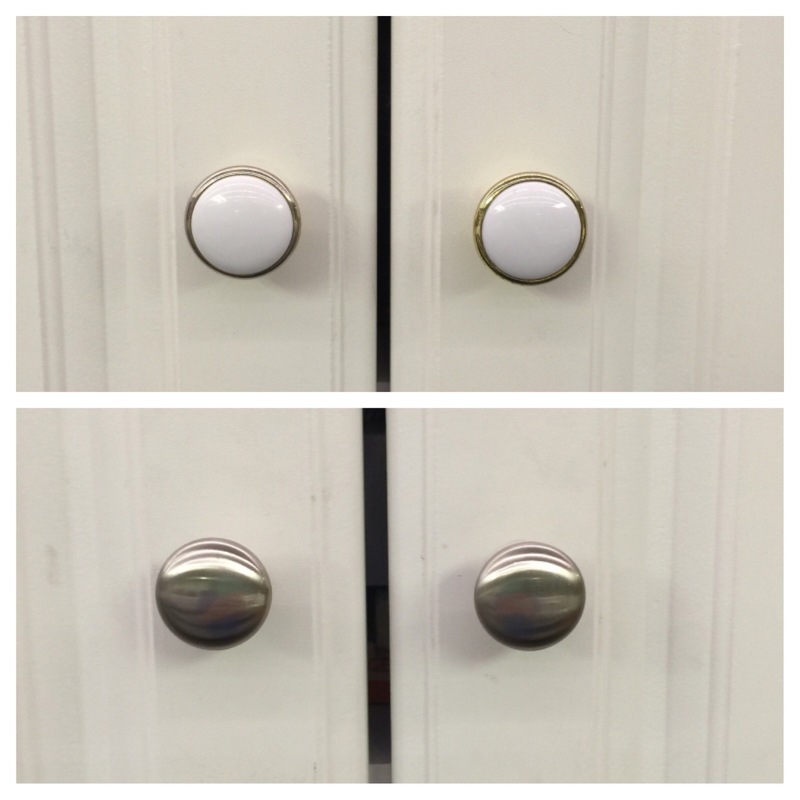 Sometimes just the littlest thing makes all the difference – like those knobs! And a can of spray paint. The cart looks great. It must be so much fun to spend time in your fabulous sewing space Katy!